The Sporting Lucas Terrier is a modern breed with a well-documented history. The breed is named for Major Sir Jocelyn Lucas, MC, KBE, MP, a Baron’s son with a keen interest in hunting dogs. After returning from World War I, he began breeding Sealyhams. Concerned about the increasing size of the show-bred Sealyhams, Sir Jocelyn began crossing his hunting Sealys with Norfolk Terriers. With his partner, the Hon. Mrs. Enid Plummer, they carefully developed this small, workmanlike Terrier, designed to work in a pack and push game out of thick cover. Today, the breed is maintained primarily as a working Terrier in Great Britain, where it is used to hunt ground vermin and go to ground when required. 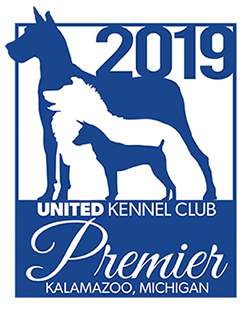 The Sporting Lucas Terrier was recognized by UKC in March, 2002. The Sporting Lucas Terrier is a low-stationed, sturdy, well-boned, compact but free-moving working terrier, standing about 12 inches at the withers, with a wiry outer coat and a thick dense undercoat. The head is in proportion to the body with a broad skull and high-set, half-prick ears. The tail is set quite high but allows adequate pelvic slope and is usually docked. Most Sporting Lucas Terriers are either predominantly white with dark patches, or dark colored with small white spots. The anatomy of the Sporting Lucas Terrier should be that of a working terrier with a flexible spine, a powerful jaw, sturdy legs, strong but never heavy bone, ample chest room without too much “spread” in front, and sound feet with well-formed pads and strong toe-nails. Judges must evaluate this breed as a working terrier, and exaggerations or faults should be penalized in proportion to how much they interfere with the dog’s ability to work. Honorable scars resulting from field work are not to be penalized. The Sporting Lucas Terrier is determined, self-confident, lively, bustling, alert, sharp-eyed, spirited, keen to hunt, fearless but not foolhardy, physically robust, active without being hyperactive, independent-minded yet responsible to training and commands. This breed is friendly by nature, extroverted but not dog aggressive or prone to give tongue without good reason. Sporting Lucas Terriers are not immediately welcoming with strangers but not immediately submissive either. This breed has a stable temperament without excessive excitability. It is willing to hunt ground vermin above and below ground, persevering in difficult working conditions. When hunting, this breed displays no hesitation in tackling ground quarry, without being too hard or oblivious to instruction. It has an offensive approach without ever being out of control. Faults: Unwillingness to go to underground; excessive hardness. The head is proportionate to the size of the body, strongly made and well boned. When viewed from the side, the distance from the stop to the nose should be two-thirds of the distance from the stop to the occiput. Skull and muzzle are joined by a well-defined stop. The skull is broad with good width between the ears. The muzzle tapers slightly from the stop to the nose, giving a strong jaw that is still broad at the nose. Jaws are built for biting and gripping, with equally strong upper and lower jaws. Lips are tight with dark pigmentation. The Sporting Lucas Terrier has a complete set of evenly spaced, white teeth, meeting in a scissors bite. Eyes are oval, dark, quite deep-set and fairly wide apart. Ears are set high, well apart, neat and V-shaped but with slightly rounded tips, carried close to the head and half-prick, dropping forward even when the dog is alert. The neck is strongly made, of good length, slightly arched, blending well into the shoulder construction. Shoulder blades and upper arms are of sufficient length and angle to permit a free front stride with good extension and ample reach of neck. The abbreviated restricted front action of many small terrier breeds is not desired. The elbows fit closely but allow free forward movement. Forelegs are straight when viewed from the front and not too heavily boned but discernibly muscled. 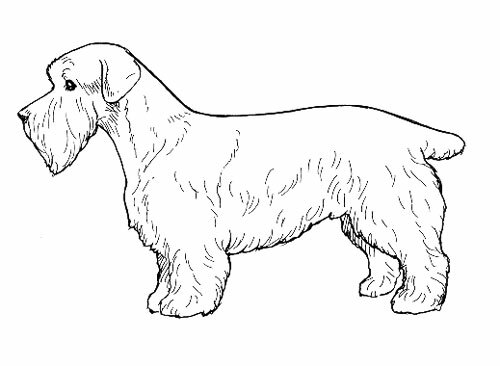 A properly proportioned Sporting Lucas Terrier is low-stationed and oblong in shape, not square in outline. The line of the back is strong and level. The loins are slightly arched, supple and strong, with a slight tuck-up in the underline. The croup is slightly sloping. The ribs extend well back and are well sprung out from the spine, forming a strong back, then curving down and inward to form a deep body. The brisket indicates a sufficient length of upper arm, reaching to or just below the elbow. Viewed from the front, the chest between the forelegs is well filled and of moderate width. Viewed from the side, the forechest extends in a shallow oval shape in front of the forelegs. Faults: Cloddy build lacking flexibility; steep shoulders; barrel chest. The hindquarters are well muscled but not broad across the hips. Pelvic angulation, turn of stifle and angulation at the hock must allow good forward reach when working underground and ample rear extension on the move, avoiding the short-stepping, chopping rear leg action of many small terriers. When the dog is standing, rear pasterns are perpendicular to the ground and, viewed from the rear, parallel to one another. Feet are small but still good-sized, round, with strong robust pads, sturdy toes and strong nails. Tail is set level with the topline, which slopes very slightly downward at the croup. Tail is carried erect but not over the back. The tail is normally docked to just less than 4 inches. The Sporting Lucas Terrier is double-coated. The outer coat is harsh and stiff, straight, lying close to the body, about 1½ inches in length. The undercoat is thick and dense. Faults: Excessive coat length; lack of density in undercoat. •Predominantly white bodied with markings of any shade of brown, grizzle or badger-gray, and black, with or without tan. •Colored any shade of brown, black and tan, or grizzle and tan. Small white markings are acceptable on the chest, brisket and feet. Desirable height, measured at the withers, ranges from 11 to 13 inches for males and 10 to12 inches for females. Desirable weight is between 14 and 18 pounds for males and between 11 and 15 pounds for females. Purposeful with a low drive and good stride, fore and aft, indicating well-laid-back shoulders and correctly-constructed hindquarters. The style is brisk, full of enthusiasm. The whole impression is one of perky assertiveness, supple strength and physical harmony. Fault: Lack of extension fore and aft when on the move, giving the abbreviated stride of the show-ring terrier breeds.